Winter is just around the corner and all too soon much of the country will be experiencing the frigid winter weather. Even though winter brings less-than-desirable weather, our dogs and puppies still require just as much physical exercise as any other time of the year to maintain their good dog health. There are times when a winter walk is not possible. In our area, for instance, we often have ice storms or frigid temperatures that make dog walking dangerous, even if you have pet insurance. That’s why we bring the exercise indoors! One solution, and my favorite way to keep my dog entertained is to give them a food dispensing toy. Food dispensing toys are an important tool to burn some of your dogs mental energy and also to teach him to problem solve. As a side benefit, food dispensing toys slow down dogs that eat fast, lessening their chance of bloat. There are many food dispensing toys on the market to choose from today. One of my favorites is the Kong Wobbler. This toy comes in two sizes and is great for both puppies and adult dogs. 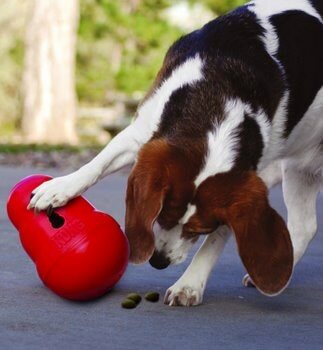 Put your dog’s dinner in the Wobbler and watch as he pushes it around to dispense his meal. Dog toy manufacturers realize the behavioral benefits of interactive of toys, and there are many options available commercially. Jolly Pet Products, Ruff Dog, Kong, Kyjen and many other companies have developed food dispensing toys that your dog may enjoy. Another option is to make your own food dispenser. Save your paper towel rolls, fold down one end, fill it with kibble and fold the other end down. Then toss it to your dog! (Be sure to keep a close eye on him so he doesn’t accidentally ingest any of the cardboard.) Another option is to put your dog’s food in a paper bag, fold down the top of the bag, and let your dog tear into the bag to get his food. Once he gets good at this, you can make the puzzle harder by putting the food in a paper bag and then put the paper bag inside a cardboard box. While you will probably have to sweep up pieces of torn cardboard tube, paper bags and boxes, the enjoyment your dog will get from “hunting” for his food will be well worth your time sweeping up! Whether you make your own food dispensing toy or buy a commercial toy, your dog will reap many benefits from eating from one of these toys, so give it a try. For more information about pet health and pet insurance visit www.petsbest.com.